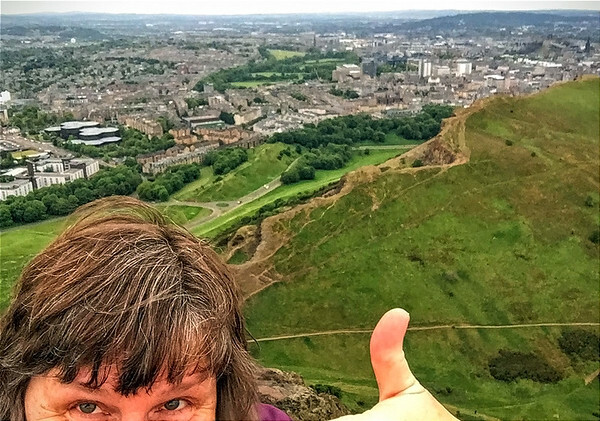 Back in June of 2015 when I finally had the chance to fulfill a longtime dream and visit the United Kingdom - something I had been wanting to do for the better part of forever - I started my journey in Scotland, first landing in Glasgow where I met up with my UK buddy Claire - aka The Doodologist and owner of CRPittDesigns - and then boarding a train for Edinburgh where we were going to spend the first few days of my vacation. 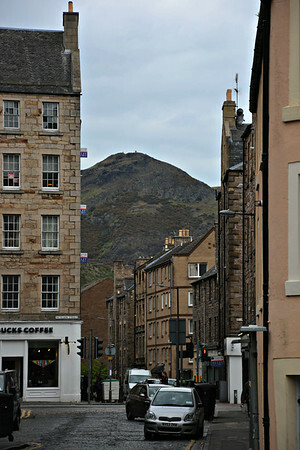 After checking into the Sherwood Guesthouse which I had found through extensive online searching and turned out to be a great place to stay in Edinburgh complete with the nicest hostess ever and easy access to all of the places we wanted to go, Claire suggested that we not waste any time and head out to climb to Arthur's Seat which we could see from the window of our room - Sherwood Guesthouse and not-so-hot photo from our room posted below. Even though I had just flown over to Scotland from Boston via Iceland and gotten darned little sleep on either leg of my flight, I had read that it was a good idea to stay awake as long as possible in order to avoid jet lag so - not feeling the least bit tired as I was just way too excited about being there - I agreed and we set out around 7:00 PM Scotland-time or a mere 2:00 PM back home in Connecticut. 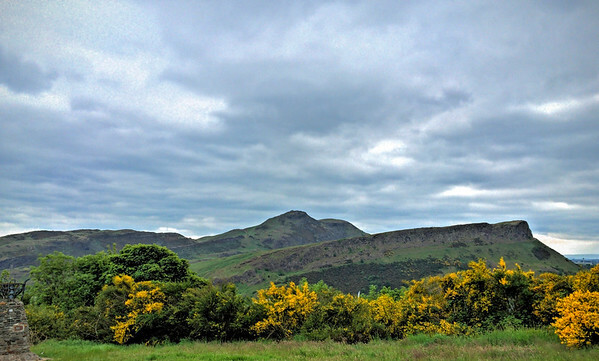 View of Arthur's Seat from Calton Hill with the Salisbury Crags in the foreground. 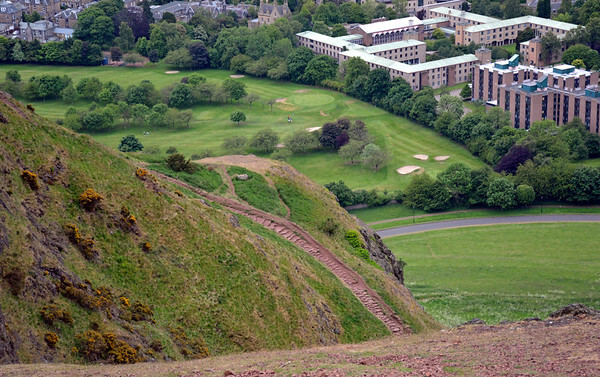 Situated about one mile east of Edinburgh Castle and standing as the highest peak in Holyrood Park - a 640-acre Royal Park adjacent to the Palace of Holyroodhouse - Arthur's Seat is an ancient volcano which was once upon a time described by Robert Louis Stevenson as "a hill for magnitude, a mountain in virtue of its bold design." 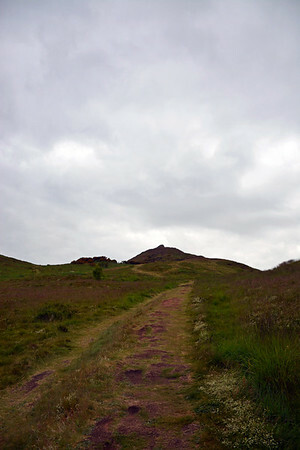 Rising 822 feet (250.5 meters) above sea level, the hill is shaped like a reclining lion (depending on what angle you're looking at it!) with the 'seat' itself said to be the notch between the highest point of the peak and a secondary point a little way to the south. 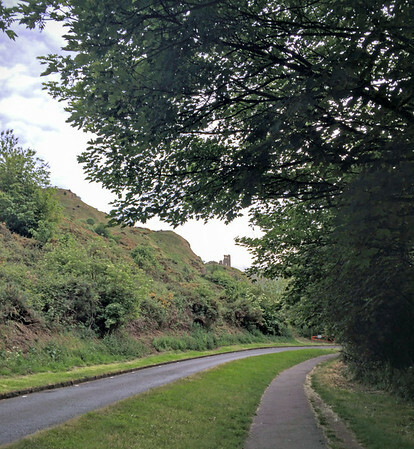 At its peak, the remains of a hill fort and its defenses are visible which are believed to date back to about 600 AD while human activity in the park can be traced back as far as 5000 BC. 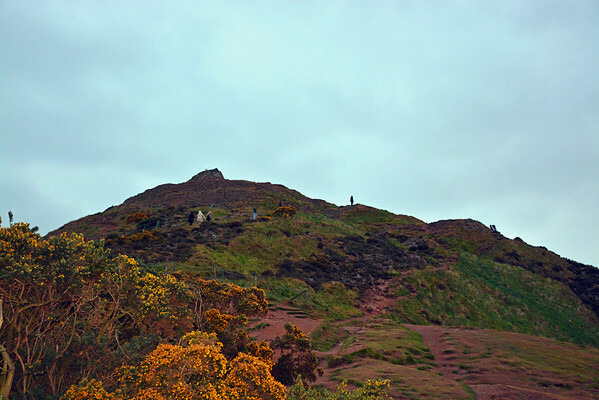 Though no one really knows how it got its name, it's often been mentioned that Arthur's Seat was one of the possible locations for Camelot, the legendary castle and court of King Arthur. 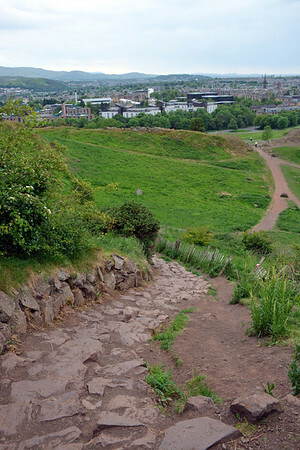 The famous hill has been featured in many novels over the years: Frankenstein by Mary Shelley, One Day by David Nicholls, The Underground City by Jules Verne and in countless Ian Rankin novels, but all literary fame aside, the reason that one climbs Arthur's Seat is to take in the views - plain and simple! 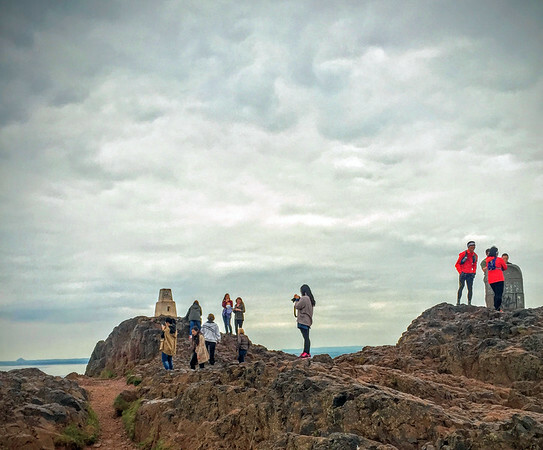 If you make the climb to the top, you're rewarded with a gorgeous 360-degree panoramic view of Edinburgh and the Lothians - a region of the Scottish Lowlands lying between the southern shore of the Firth of Forth and the Lammermuir Hills. 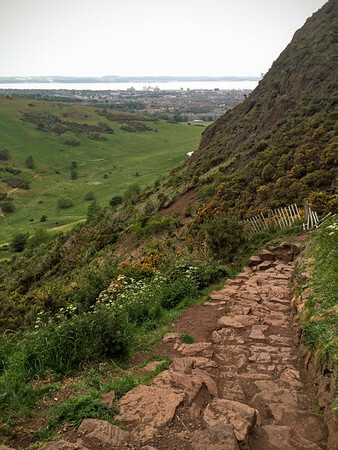 As you can see from the map above, there are several different route options for getting to Arthur's Seat ranging from quite steep to not-too-steep and from 30 minutes to several hours. Claire and I didn't possess this map at the time of our climb so after entering the park we took the option that was basically right in front of us which turned out to be the Purple Route described as "Steep and short. A great path, but you need a head for heights!" as well as "The way the crows fly and the adventurous way to the top!" by Geowalks. 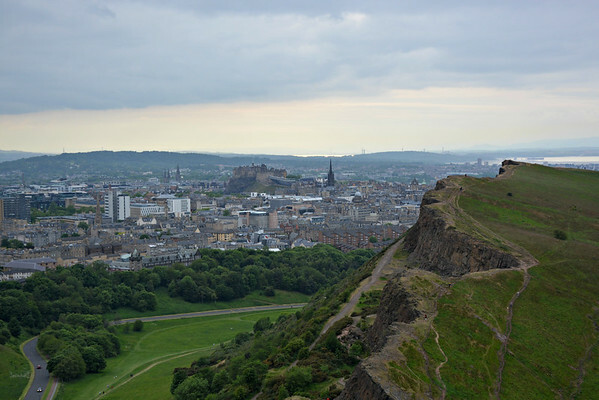 As we made our ascent, I could see Edinburgh Castle starting to emerge from behind the Salisbury Crags - which look a lot closer than they really were in this photo being that I was trying to zoom in on the castle! One of the good things about being a photographer is that I could use the excuse of "I have to stop to take a photo" quite frequently even though it was really more the excuse of "I have to stop and try to catch my breath!" while I snapped a couple photos of the path. Quite sure that Claire knew which excuse I was really using but she was an awful good sport about it. 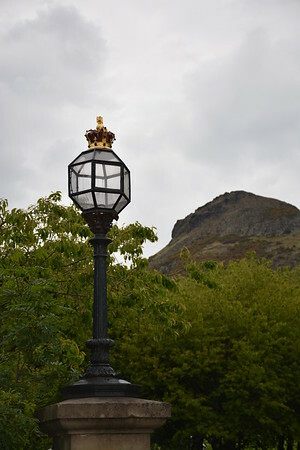 With the Salisbury Crags getting lower as we were climbing higher, I was able to get a better look at Edinburgh Castle. 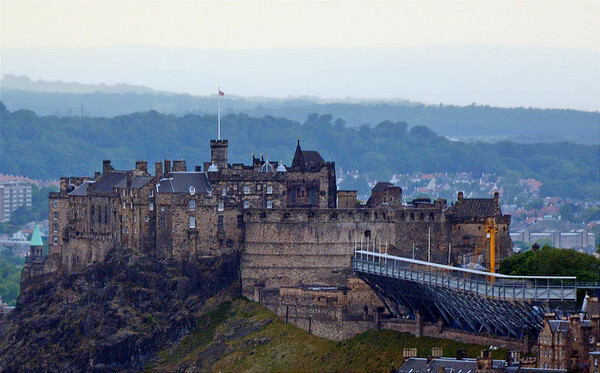 The structure to the right of it (along with a couple of cranes) is the seating for the Royal Edinburgh Military Tattoo - an annual event held each August on the esplanade of the castle with performances by British Armed Forces, Commonwealth and international military bands and artistic performance teams. They obviously set up quite early as it was only early June when I was there - no procrastinating there! 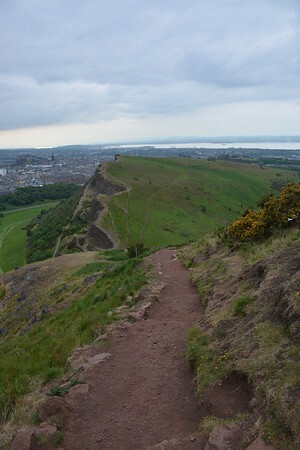 Another view of the path we were climbing up as well as a closer view of Edinburgh Castle below. 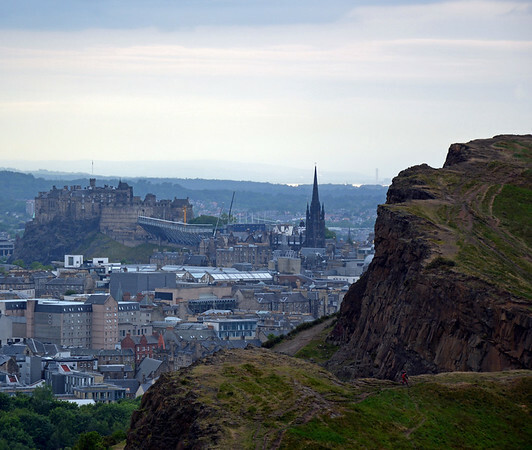 Salisbury Crags - the dramatic looking cliffs to the right in the photo below - are a series of 151 foot (46-metre) hills which rise up on the west of Holyrood Park. 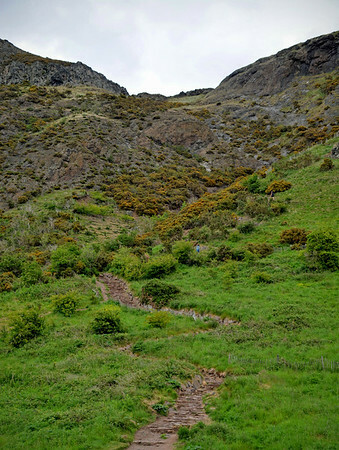 Formed from steep dolerite (subvolcanic rock equivalent to volcanic basalt) and columnar basalt, the Salisbury Crags have a long history of rock climbing on their faces starting from the earliest days of the sport but due to hazards from falling rocks, etc, climbing is now restricted to a designated area of the South Quarry. 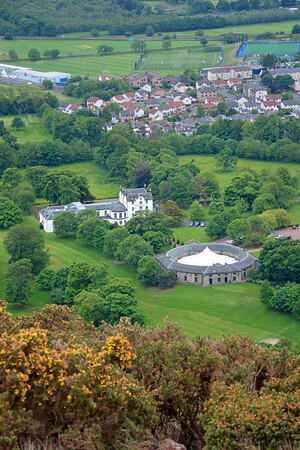 Climbers need to apply for a permit, free of charge, at the education centre in the north of the park in order to be allowed to climb. 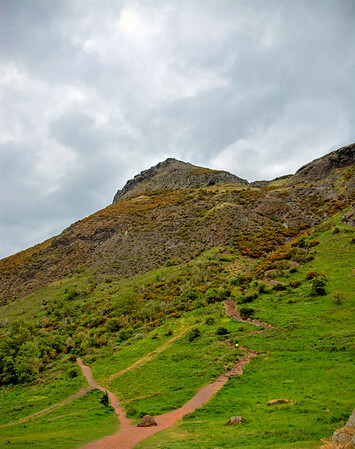 As you can see, there are paths around the crags so one can certainly conquer their heights via other methods even if you can't climb up the face of them anymore. 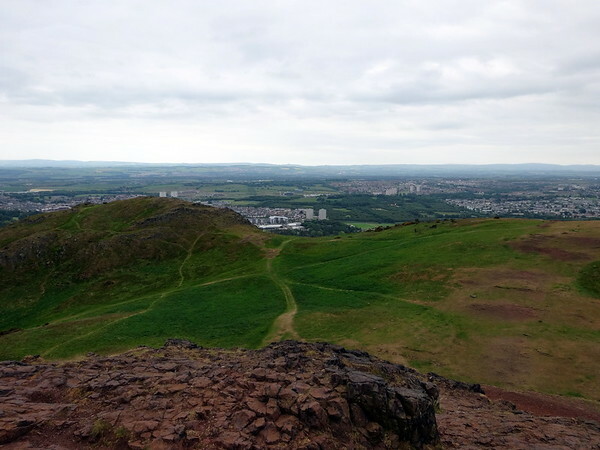 Once we made it to the top of Nether Hill, our path changed from rocky stairs to dirt as we got closer to the summit of Arthur's Seat which was a bit of a welcome relief to my old knees! 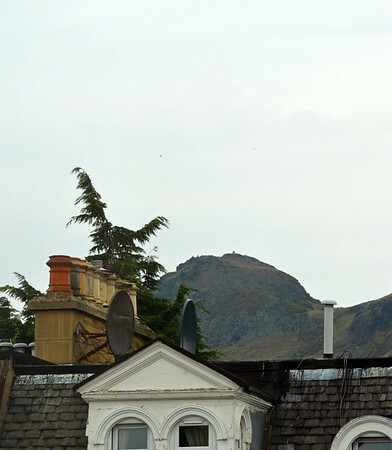 The photo to the left is looking down at The Prestonfield Hotel and Stables, a former private estate with quite a storied history that is now a luxury 5-star hotel considered to be one of Edinburgh's finest as well as a very popular wedding venue. Yay! 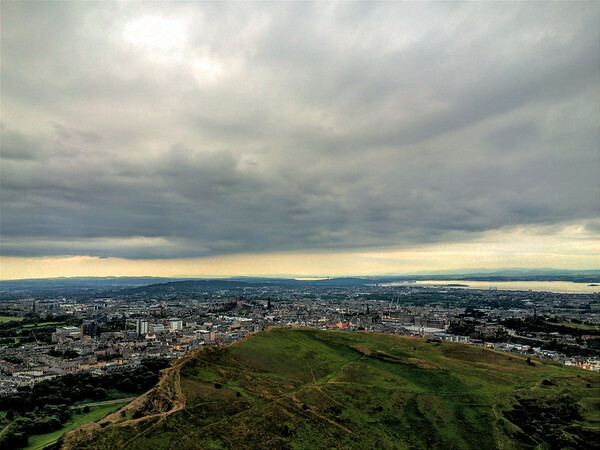 The summit where we were rewarded with some rather cloudy views of Edinburgh and the surrounding area! Definitely worth the climb even though my legs were still feeling somewhat gelatinous. 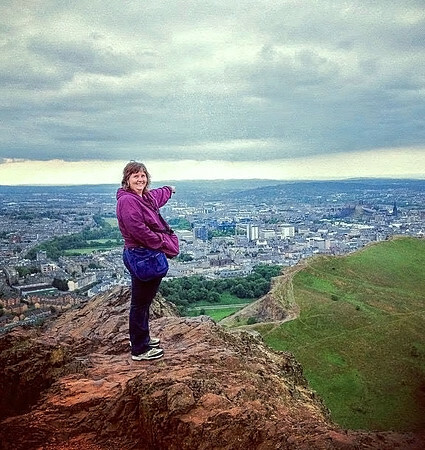 Documented proof by Claire that I had indeed made it to the top. Yay me! 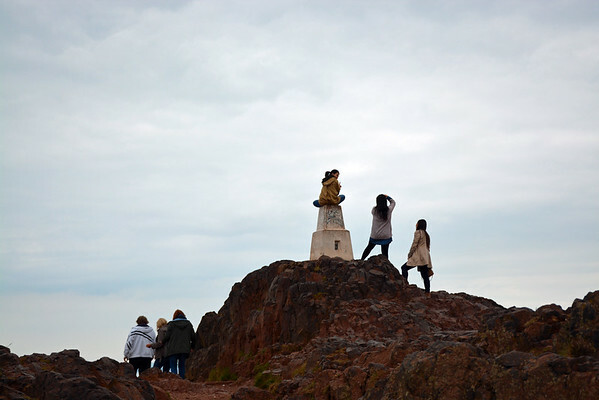 Obviously climbing to the summit of Arthur's Seat is a popular thing to do as evidenced by all the other folks that were clambering around with us. There was a lot of photo-taking going on not just by myself! 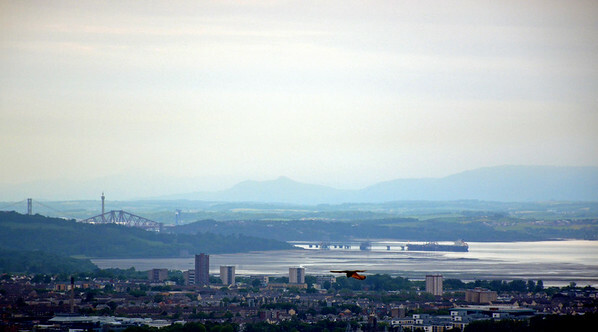 Looking out over the Firth of Forth, that's the island of Inchkeith in the distance. 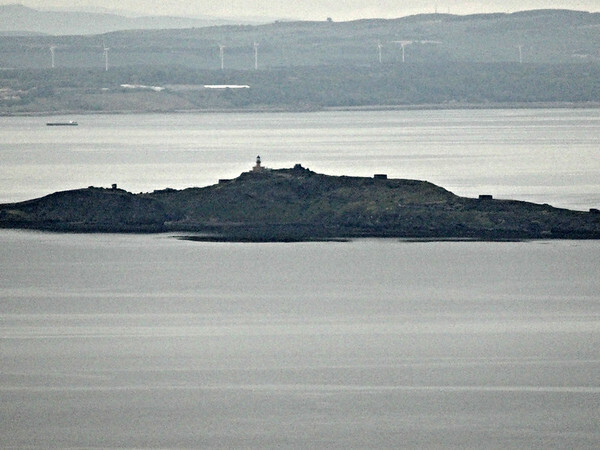 Not that I could get a very good view of it from where I was but there's an 1804 lighthouse on the island that was erected by Thomas Smith, a tinsmith, lamp maker, and ingenious mechanic who was appointed as engineer to the newly formed Northern Lighthouse Board in 1786. Smith - who designed 10 Scottish lighthouses - was the stepfather of Robert Stevenson who began work as his assistant at the age of 19 and went on to become a well-known Scottish civil engineer and famed designer and builder of 16 Scottish lighthouses of his own; he was also the grandson of the famed Scottish author Robert Louis Stevenson mentioned at the beginning of this post. ... while some of us were resorting to taking silly selfies while trying not to topple over the edge by foolishly standing too close! 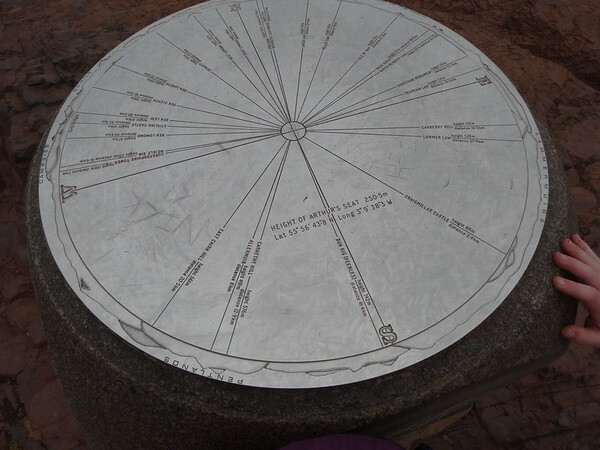 A directional marker at the summit gives you the chance to actually know what it is you're looking at. Always a good thing! Okay then ... which way to head back down? Going back down the way we came up didn't really sound too appealing to me as it was one thing to climb up a steep path but another to climb back down it ... especially when my out-of-shape-for-this-kind-of-thing legs were still somewhat on the shaky side. I knew how steep it was going up and how narrow the steps were in some spots so I thought it might be safer to take a different route. 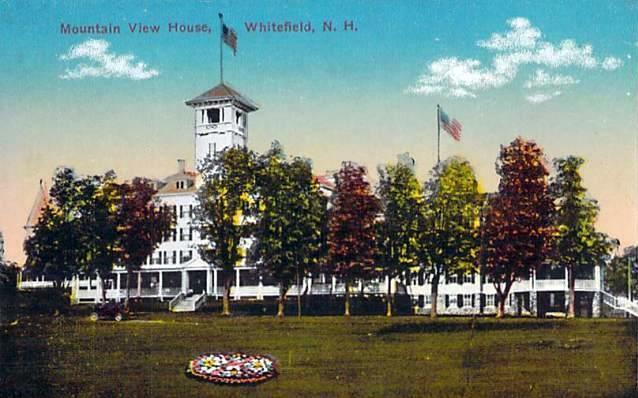 I didn't want to die or end up in hospital on my very first day of vacation! Hmmm ... what about if we head that way instead? Rather than take the steep Purple Route back, we could take the Green Route (aka "The Lazy Man's" route according to the Geowalks page) which goes back down the other side. 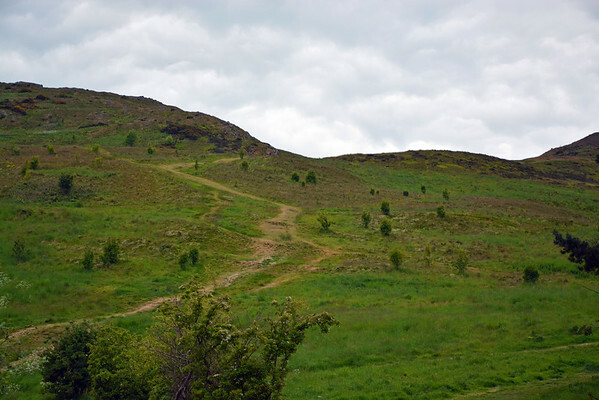 It's a steep 30-minute walk that leads down to Dunsapie Loch, a small artificial loch that was created at the initiative of Prince Albert, Consort to Queen Victoria, in 1844, but not a scary steep walk as it crosses over ancient agricultural terraces rather than carved-in-the-side-of-the-hill switchback stairs. 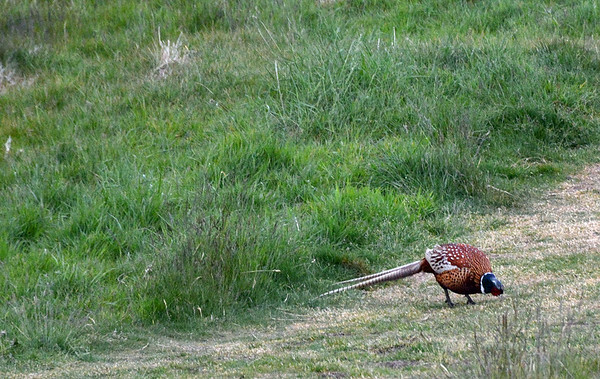 Alright then, not knowing exactly how long it was going to take us to get back to the guesthouse heading down a different way but being the adventurous sort, off we started back down the hills on a path that this pheasant didn't seem to mind at all. Looking back up the way we came, the path definitely does look a touch steep though certainly not as steep as the steps we climbed up on our way to the top were. Plus there was no clinging to the side of a cliff required though the grass was a bit slippery in places if you weren't careful. 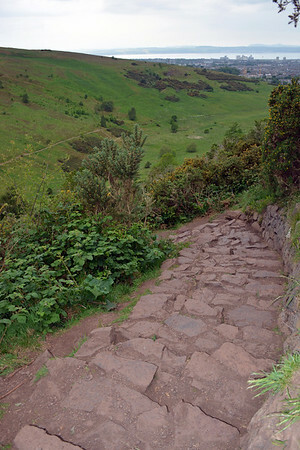 Another look back does show that it's nowhere near as steep as the steps we took going up. Described as "quick but not as fun!" one doesn't need to embrace their inner mountain goat to go this route but it does require a bit of effort. As we were heading down rather than up, the effort was more to keep ourselves from going too fast and ending up in a heap at the bottom of the hill. At the bottom we found ourselves on Queen's Drive near the car park by Dunsapie Loch where we made a left rather than a right which would have gotten us back to our guesthouse a lot quicker. Oops. But the ruins in the distance were calling to me and how could I resist? 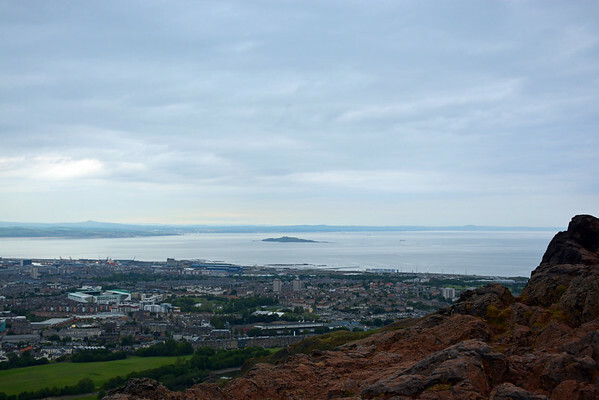 It was my first day in Scotland after all! After a bit of easy walking about a mile down Queen's Drive, we came to Saint Margaret's Loch - a shallow man-made loch that is about 3/10ths of a mile (500 metres) east of Holyrood Palace and less than 1/10th of a mile (100 metres) north of the ruin of Saint Anthony's Chapel. 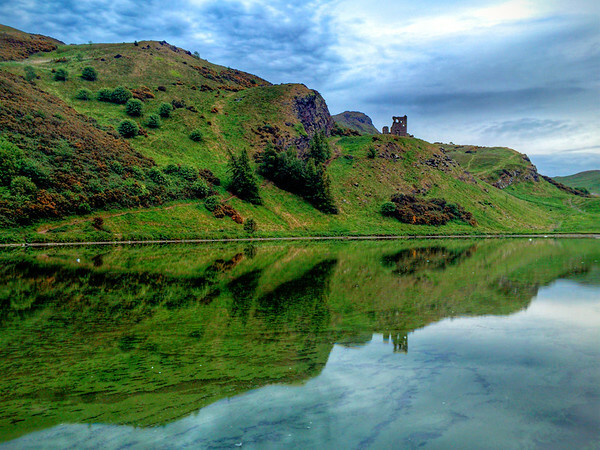 Once a boggy marshland, Saint Margaret's Loch was formed in 1856 as part of Prince Albert's improvement plans for the area surrounding the palace. 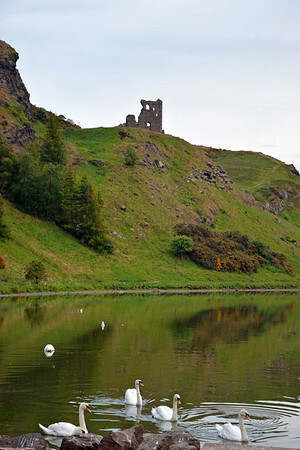 Though the loch has been used as a boating pond it is now home to a strong population of ducks, geese, and swans who might not approve of sharing the loch with boaters. The origin and the history of Saint Anthony's Chapel are obscure but it was certainly built no later than the early 15th century as in 1426 it is recorded that the Pope gave money for its repair. The chapel may have been linked to the Preceptory of Saint Anthony, a skin hospice, which was based in Leith around this time or it may have been linked to the nearby Holyrood Abbey - no one really knows for sure. 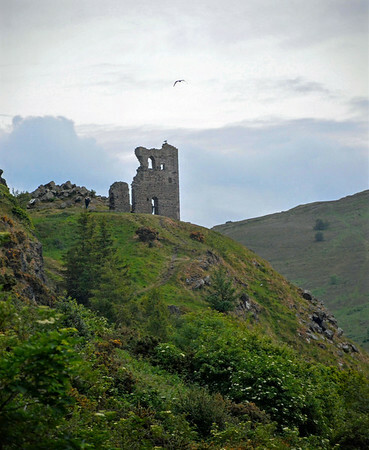 Originally rectangular in shape around 43 by 18 feet (13.1 by 5.5 metres) with 3-foot (0.91 metres) thick walls built with local stone, the tower would have stood just over 39 feet (12 metres) high and probably had a spiral staircase inside. The chapel is now a ruin with only the north wall and a fragment of the west wall remaining next to part of an ancillary building. It is possible to hike up to the ruins but as it was starting to get late and looking more and more like it wanted to rain - plus we had no idea how much further of a walk we had to get back to our guesthouse - we didn't try to do any further exploring but struck back out on Queen's Drive in the direction of town. 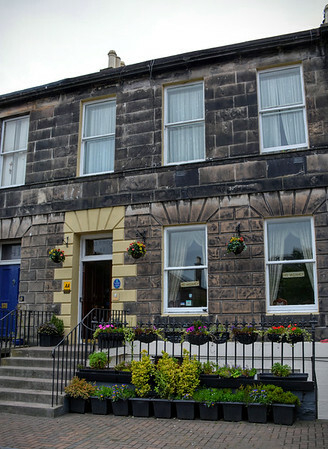 As it turned out, we had another two miles to walk before finally getting back to Sherwood Guesthouse and even though I was definitely worn out after we finally got the key in the door and climbed the stairs to our room - ouch! 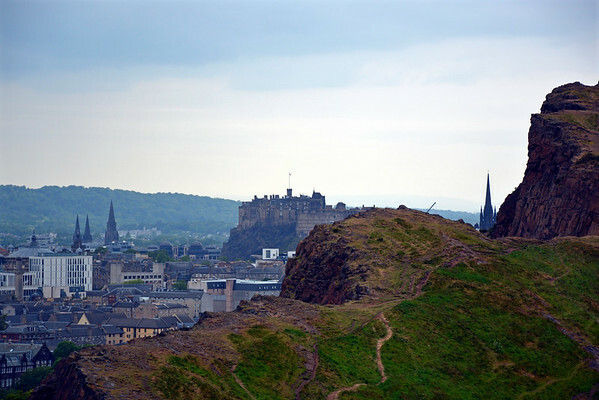 - it was a great first evening in Edinburgh and I wouldn't have missed it for the world. Unfortunately all of the restaurants in the area were closed by the time we got back as it was after 10 pm so we were only able to celebrate our climb with sandwiches, salads, a can of Irn-Bru, and other goodies from the local Tesco Express but it was a feast nonetheless and I quite enjoyed every bit of it! "Scotland's Other National Beverage" ... or so they say! Oh my! My legs would be beyond jello after a hike like that. Thank you for enduring so you could take such great pictures for the rest of us poor landlubbers who never get to travel!